Let me present my next guest blogger here on kokblog: Jeremy Shapiro, a professional chef and incredible baker. For over 20 years Jeremy has been cooking in top kitchens in New York City and beyond. Today he is the head chef in a super secret private club in New York where he lures customers with endless sweets and savory treats. Jeremy is also creator and editor of Stir the Pot, a food blog that he started in 2005. If you visit his site you will soon discover that bread is a major subject. 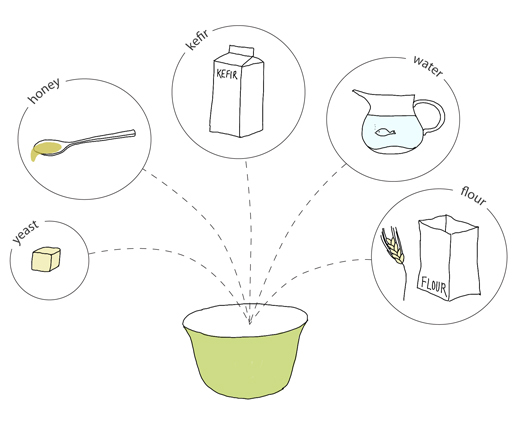 Jeremy explores different kinds of baking methods as well as flour and grain types. He bakes both sweet and savory, including croissants, fruit tarts, rustic rye breads, pizza, baguettes, bagels, loaves and breads with airy crumbs & crispy crusts. 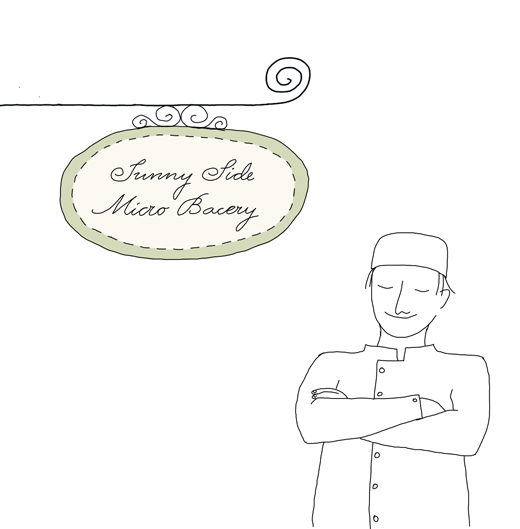 This summer Jeremy started a Micro Bakery in his apartment kitchen (just bigger than a bread box according to him). I’m impressed by his energy; he seems to be active, baking and cooking 24 hours per day. Jeremy also interviews people in the food world that he finds interesting, from professional chefs to home cooks like myself (ahem), including Ibán Yarza who has previously appeared here on kokblog as a guest blogger. He has also connected with Sandor Ellix Katz, Anthony Bourdain, Dan Lepard and many many more. I really recommend listening to his interviews, or just reading through the list of names. It’s a great and unusual recourse of inspiration. While on my visits in Istanbul cooking for my friend in her restaurant, I would daily pass a pide restaurant. Though I never tried from this specific place, I was able to try some from a young knowledgeable baker employed by my friend. He’d show his amazing hand skills with dough’s supple and see through like durum, not the flour of the same name, but the roll up wrap style sandwich bread a common street food in Turkey. 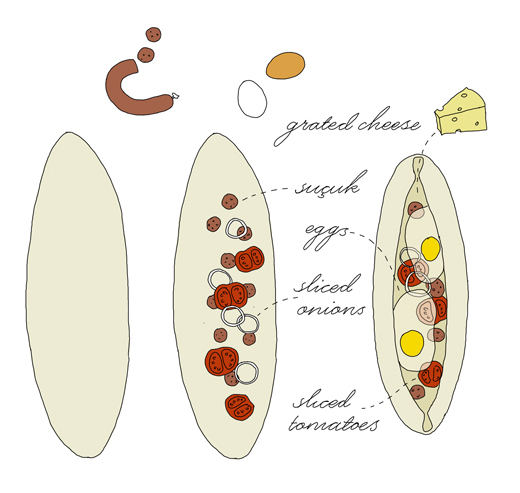 When I returned to NYC, I’d often yearn a good pide with suçuk or sujuk, a spicy sausage that can be ground or sliced to accompany a canoe shaped pide, filled with cheese, tomatoes, eggs. When I finally sourced an amazing Montenegro butchers suçuk I was in business. As well as playing with this dough for different guises, like a lamacjun or a Ramadan flat bread. It’s a bit tricky to make pide with sourdough, so an easy and quick yeast dough is just as good. You could approach this basically like any straight dough, mix all the ingredients and bulk ferment till doubled. Then divide and shape according to your desired need. For a pide, or pizza you could take say 80g-100g of dough, roll it out with a rolling pin, or press your hands to flatten the dough oblong about 10 to 12 inches long. Keeping the ends pointy and the sides about 6 inches wide. The choice of fillings can be anything, think local if you can, and seasonal… Though I love cheese, onion, tomatoes and egg, and yes, suçuk, that may not be a possibility to find those items. 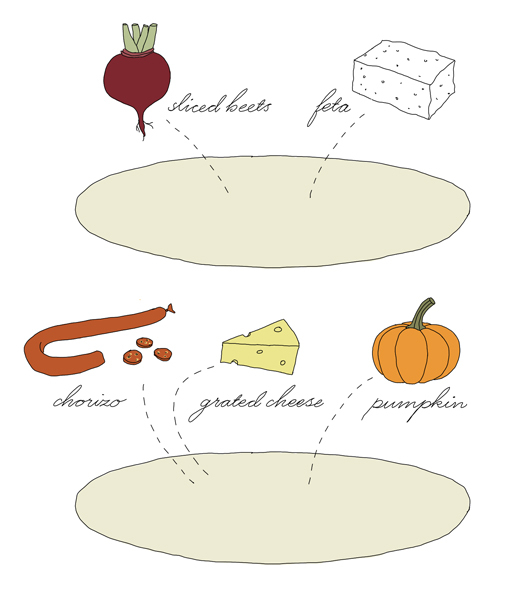 Some nice choices, beet tops and feta, or chorizo with pumpkin? 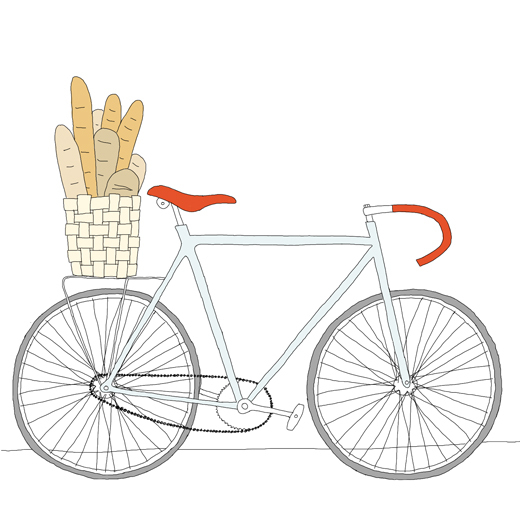 Ibán Yarza is a self-taught baker (and bike mechanic) based in Barcelona where he organizes baking classes and promotes good bread for everyone. I first got to know of him through his site ¿Te quedas a cenar? (“Are you staying for dinner?”) and for the last few years we have been talking through twitter, mostly about baking, cookbooks and Sweden. Iban runs two other websites that are only dedicated to bread, La Memoria del Pan where he shares stories and interviews and El Foro del Pan which is the leading bread forum in Spain (they have one section in English). Ibán has been to Sweden several times and he probably knows much more about traditional Swedish baked goods than many Swedes. Last year he worked as a volunteer at Ramsjö Gård, an organic farm in Björklinge (north of Stockholm) where he followed their daily work for 2 months. Lately Ibán has been seen on Spanish Television where he bakes together with David Jorge and Robin Food. In one episode he bakes my absolute favorite, a classic Swedish Cardamom bun. Ibán has an education in journalism and translation. In 2010 he translated Dan Lepard‘s book “The Handmade Loaf ” from English to Spanish. I’m so happy I finally asked Ibán to be my guest here on Kokblog. Welcome! There is a certain austerity to many traditional Spanish dishes that I find utterly appealing. It probably has to do with the fact that I grew up with my grandparents, my grandmother being a classic example of a Spanish cook: hardly any spice in the cupboard, simple and honest ingredients bought daily at the local market and cooked in the simplest of ways (stewed, boiled, braised, fried) always respecting the flavor of the ingredients in the pan. Simple as they can be, some recipes that date back to the Middle Ages can bring unique emotions to our table, well in the 21st century. Sopa de ajo (literally “garlic soup”) is one of those dishes, an example of the great cuisine of bread, the kingdom of leftovers and the audacity to make the best out of what’s in the larder. A simple and filling meal made out of stale bread, what many Spaniards would definitely refer to as their favorite wintertime comfort food (another soup, gazpacho, most likely being its summertime counterpart). If one had a look at the menu of top-notch Spanish restaurants over the last years, a clear Asian influence would be easily noticeable, in the form of a zen-esque approach to elaborations and presentations. However, if you dive deep enough into traditional Spanish cookbooks, simple, minimal recipes appear with an almost-spiritual scarcity of means and ingredients that could seduce any Zen master. A famous Spanish writer and gourmet, Xavier Domingo, once described traditional Spanish cookery as “a minimal cuisine”, with only three basic foundations: olive oil, garlic and bread. Sopa de ajo remains a peerless example of this. Then there is something about the word “sopa” (soup) and bread, the essential food. They go hand in hand in the mind and speech of Spaniards. Even to this day, the first meaning of this word in Spanish does not refer to the liquid food, but to a piece of bread soaked in liquid. In fact, “hacer sopas” (literally “to make soups”; this is, to soak bread in stock, coffee or whatever is at hand) seems to remain a favorite way of eating in my homeland, both pleasant and nutritious. You can find soups made with bread throughout Spain, from North to South, from Majorca to Andalucía, cold and hot, thick and light, meaty or full of vegetables. The recipe below is perhaps the best known version, where only four ingredients (bread, garlic, olive oil and paprika) are able to convey childhood memories and a bit of daydreaming on a dull winter evening. As any traditional meal, recipes vary from one family to another. Seasonal hint: because of the lack of meat, this soup has traditionally been a Lent dish; in fact, the whole concoction is plain and clear frugality. Rejoice. 1,5 liter water (or stock, if you happen to have it at hand; but water is more than OK). 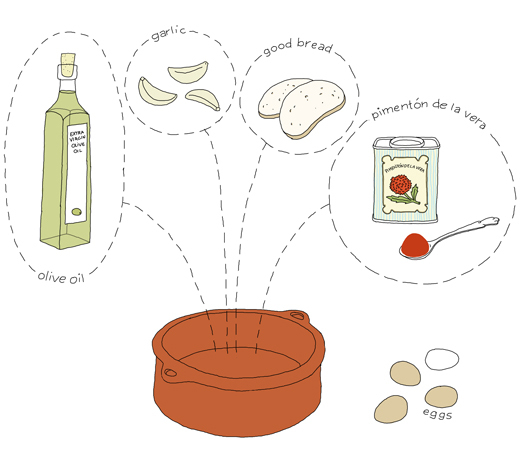 Traditionally, in Spain you would use a clay pot for this recipe, but any deep pot would do. Slice the cloves of garlic and fry them in olive oil until they’re golden (I tend to think that the amount of olive oil we use in Spain would seem rather large abroad; just don’t be shy, pour it in). Take the pieces of garlic out of the pan and keep them aside so they don’t burn and turn bitter. Now place the bread in the pan and fry in the remaining oil (it will soak up part of the oil). Take the pot off the stove, add the paprika and stir with the bread and oil making sure it doesn’t burn, otherwise it would lose its wonderful fragrance and turn bitter and tart. Once this is done, add the water (or stock) and garlic, and let it simmer for some 10-15 minutes. At the very beginning, it will probably not look the most appetizing of meals, but just be confident, time will bind the soup and the result will be simply delicious. Some people like to have their sopa de ajo really thick and dry (some even finish it in the oven), I prefer to keep mine just on the creamy side of the term soup, with thick blobs of creamy bread that melts in your mouth. Once the soup has thickened, and while I set the table, I like to take the pot off the stove and use the remaining heat to poach one egg per person. Once at the table, the yolk will break in each guest’s bowl, taking the sopa the ajo experience to its very limit, so to speak. Sometimes I also like to sprinkle a bit of ground cumin. Feel free to add anything you like. After being tired of not finding great Knäckebröd, Scandinavian Crisp Bread in the stores around my neighborhood in East Village, I started to make my own. Traditionally they are made as round wafers with a hole in the middle so you could store them hanging on a stick in the roof. 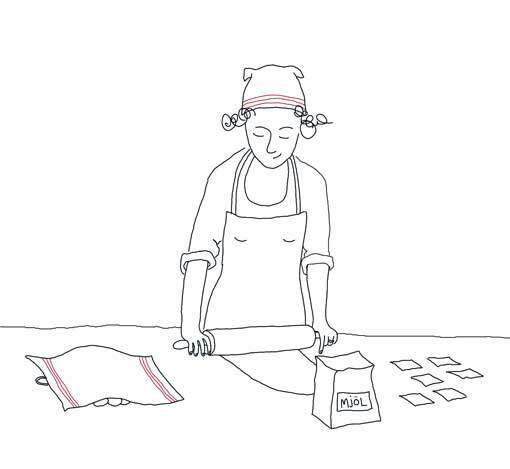 They are often made with rye flour and rolled out with a special rolling pin with knobs. 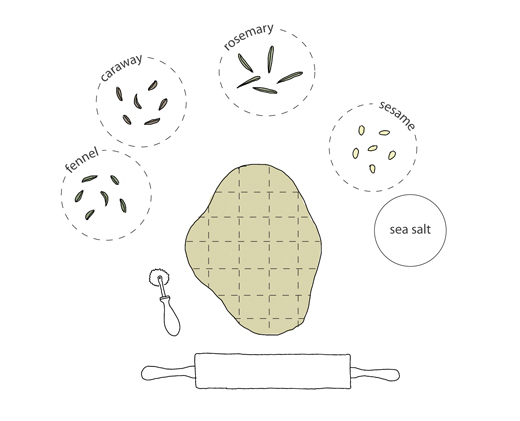 However I usually don’t use this tool and I like my home made knäckebröd as small crackers flavored with either or a combination of some: caraway seeds, fennel seeds, sesame and rosemary. 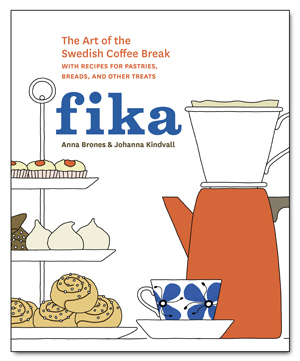 My recipe is based on Alice Brax knäckebröd recipe. Warm the yogurt with the water to 37°C (100°F). Dissolve the yeast in some of the warm yogurt mixture. Add the rest of the liquid and blend in honey and rye and regular flour. The dough will be quite sticky. Cover the bowl and keep at room temperature in a non-drafty area overnight or for at least 6 hours. When the dough is ready, work in just enough of regular flour. Knead the dough on a floured counter top until the dough is smooth. Preheat the oven to 225°C (435°F). Divide the dough into 15-20 equal parts. With your fingers sprinkle either caraway, fennel, sesame or rosemary together with flaky sea salt over each part and roll them into balls. Use a rolling pin and some regular flour to roll out every ball of dough very thinly. Using a cookie cutter or a sharp knife, cut into approximately 5 cm (2 inch) shapes. Place as many as you can fit on a greased baking tin. Bake the crackers immediately for about 8-10 minutes in the middle of the oven. depending on your oven you may have to turn them around to get nice all around color. When finished let the breads cool on an oven rack or a clean table. Keep the crackers in sealed containers. Also check out my Wild Fennel Knäckebröd I baked in Sicily, with sourdough and Perciasacchi semola. A couple of weeks ago I was contacted by Sharon Hunt who wanted to contribute a guest post here on Kokblog. I was flattered and happy she chose to post about the Newfoundland specialty, Toutons, which I had never heard of. Sharon Hunt is a freelance writer in Canada. Her food writing has appeared in Edible Toronto, Shambhala Sun, and in Gastronomica. Sharon also works for the Stratford Chefs School in Stratford, Ontario, which is one of Canada’s premier culinary training institutes. Mom Skanes – my maternal grandmother – was proud of two things, her long, dark hair that she braided and wound around her head like a bee hive, and her skill as a baker. She could bake anything, but what she made best was bread. It had a perfect crust, a perfect crumb, and it never lasted long so she made it almost every day, until my grandfather died. 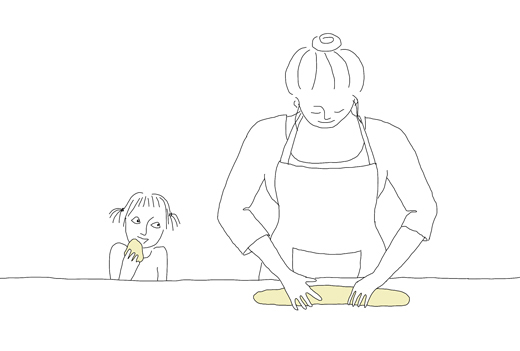 Mom Skanes had plenty of practice perfecting her bread making skills since she started at four, when she climbed onto a stool by the kitchen counter, and punched and kneaded dough with her tiny fists. Coming from a family of twelve children, there was no time for a carefree childhood. Everyone contributed to the family’s survival and being a girl in the early years of the twentieth century meant her contribution was in the kitchen. In her own kitchen she had a huge oil stove with two ovens, six burners and a warming compartment; the stove was always humming with activity. When I slept over on a Friday night I couldn’t wait to run downstairs Saturday morning and sit with my feet wrapped in a towel and propped on an oven door, while she made cocoa and sometimes … oh please, yes, yes, toutons. Toutons are white bread dough that is fried and served like pancakes. Mom Skanes would slice off pieces of dough, let me shape them, and then she fried the toutons until each side had a gentle, golden hue. Having risen as they fried, they were hot and light, crispy outside, and soft but not doughy inside. The aroma of hot bread and melted butter was intoxicating, and with my first bite the crust cracked and heat filled my mouth. I started to laugh; so did my grandmother. When I was finished, I licked my fingers, the only time she let me do that. Sharing toutons with her on those quiet, early mornings are among my best memories of time spent with my grandmother. Toutons were originally made using left-over scraps of bread dough, but they became so popular that bread dough was made just for toutons. Here is a half recipe of Mom Skanes’ white bread dough so you can try toutons for yourself. Cut the dough into equal-sized pieces, form into balls and then flatten into pancakes. Heat butter in a heavy frying pan, add toutons and cook on medium heat until each side is golden and a knife piercing the center shows the dough cooked inside (about 10-12 minutes). Sprinkle with salt and enjoy (caution, they are hot). I just celebrated a big thing in both M’s and my life with a mingling and eating party in our garden. One of the treats was my own version of Alice’s Knäckebröd. I made them into crackers and added rosemary and sea salt. We served them with my Elderflower Gravlax, but they are just as good as snacks! We also discovered that they were excellent with Västerbotten Ost (one of the best cheeses in Sweden) topped with fig marmalade. Warm the yogurt with the water to 37°C (100°F). Dissolve the yeast in some of the warm yogurt mixture. Add the rest of the liquid and blend in honey, rye and all-purpose flour. The dough will be quite sticky. Cover the bowl and keep at room temperature in a non-drafty area overnight or for at least 6 hours. Roast the caraway seeds in a dry pan and crush them finely in a mortar. When the dough is ready, work in the all-purpose flour. Continue to work the dough on the countertop until the dough is smooth. Preheat the oven to 200°C (400°F). Divide the dough into 15-20 equal parts. With your fingers crush some rosemary and flaky sea salt into each part and roll them into balls. Use a rolling pin and some all-purpose flour to roll out every ball of dough very thinly. Using a cookie cutter or a sharp knife, cut into approximately 5 cm (2 inch) shapes. Place as many as you can fit on a greased baking tin. Bake the crackers for about 5-10 minutes in the middle of the oven. Depending on your oven you may have to turn them around to get nice all around color. When finished let the breads cool on an oven rack or a clean table. Keep the crackers in sealed containers.